Growing succulents indoors can add a touch of beauty to your home. Also, they are easy to grow. Check out these 15 Best Indoor Succulent Planting Ideas for inspiration! In addition, succulents look stunning planted alone or accommodated in such a way that looks like a small garden, because the color and foliage variation in succulent seems almost endless: green, blue, pink, red, yellow, white, purple, almost black and much more. 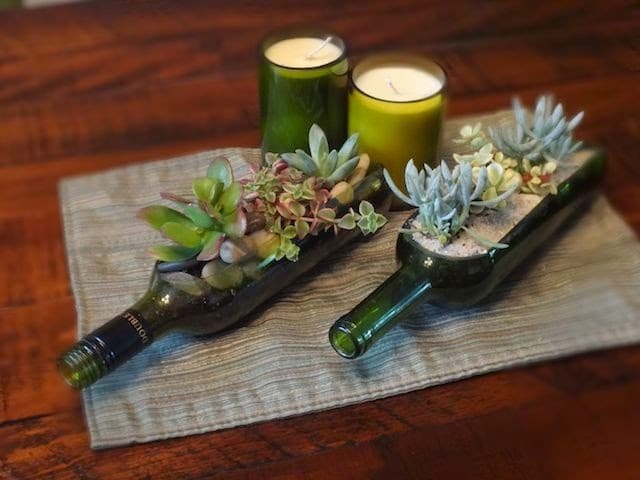 Fantastic way to upcycle wine bottles into these cute succulent planters. You’ll need to cut wine bottle from side to fill soil in it. Small succulents and cacti are perfect for this. 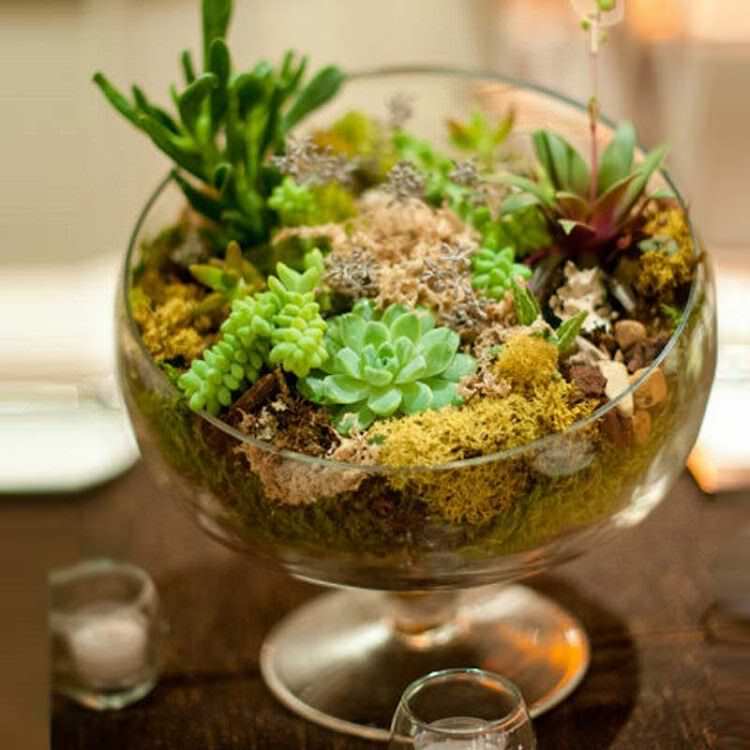 Succulents blend well with each other and are well suited for centerpieces and other decors, consider a wedding. The container may vary in size, enormously, leading to all sorts of effects. 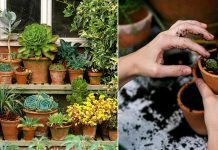 Bowls, pots, vases or glasses can be tried out for your succulent bowl garden. In your succulent bowl garden, there will be no drainage so be careful when watering, water sporadically and keep the soil relatively dry. 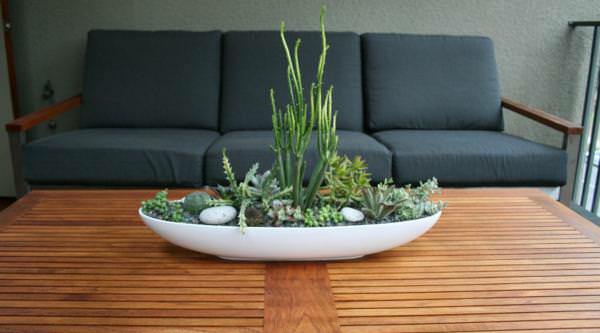 You can find a complete tutorial on succulent bowl garden here! 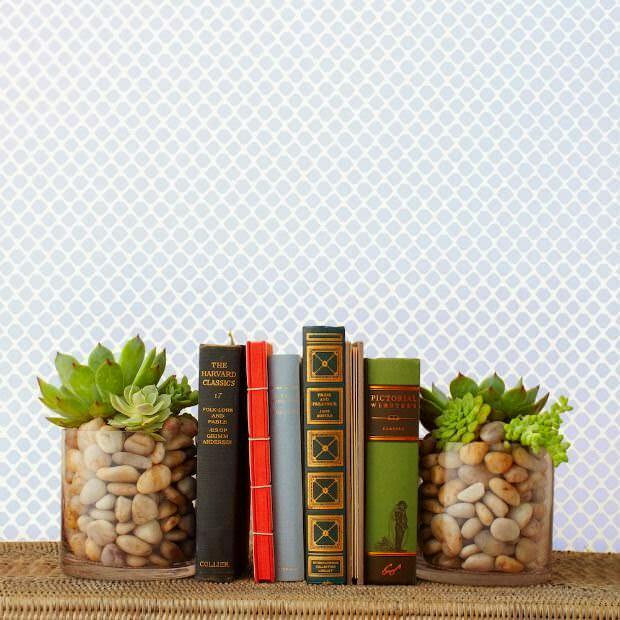 Prop up your favorite reads with this easy-to-make mini garden. Succulents are easy to grow. 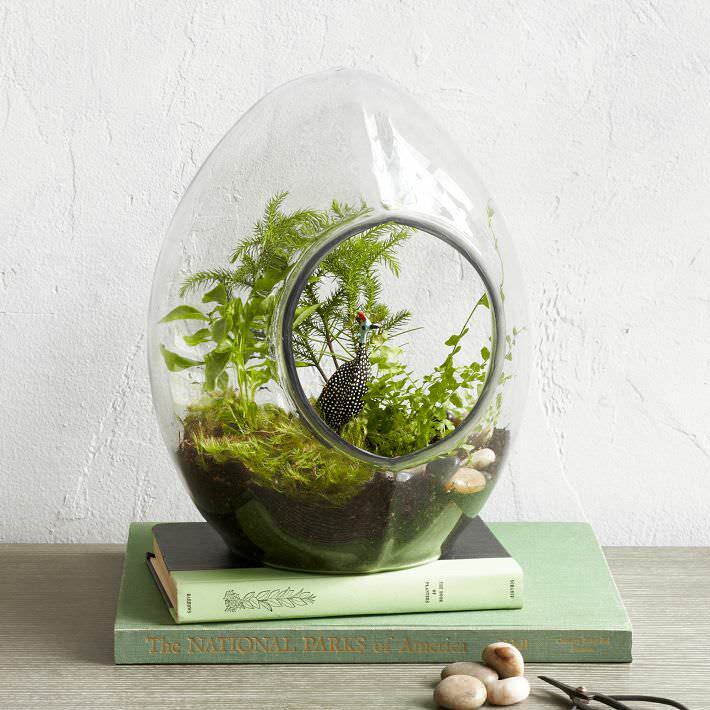 They add a welcome pop of greenery to any book collection when planted in clear vases filled with pretty river stones. Here’s how to create your own. Mason jars are perfect for planting succulents in. 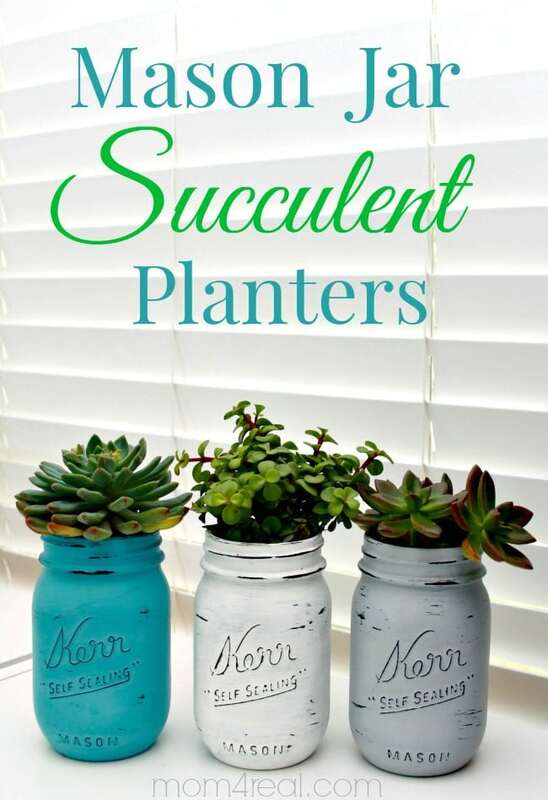 You can either plant succulents in transparent mason jars or paint them with two coats of chalky finish paint. Once the paint dries out lightly sand them and finish up with a thin coat of wax. Vintage suitcases aren’t hard to find, you may even have one lying around your house. Here is the tutorial. Turn an old book into a sassy succulent planter. 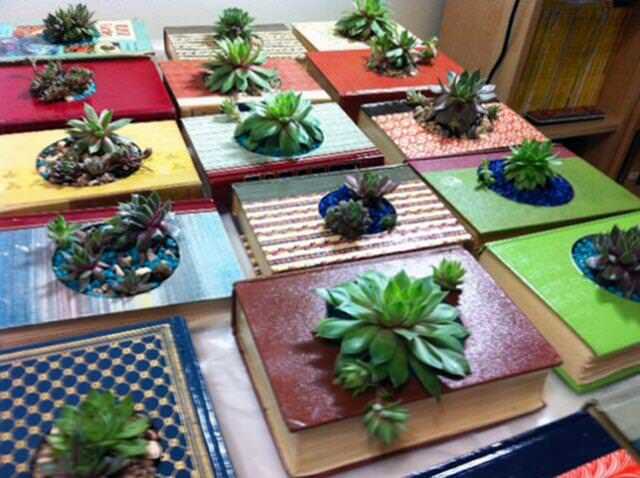 Give a new life to your old books by planting a succulent between their pages. Here is more on it! 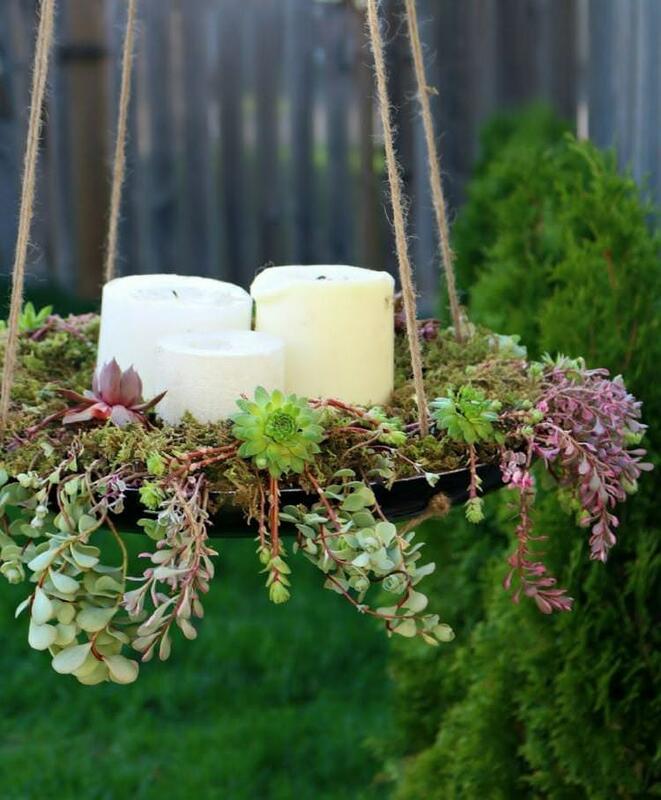 Make this easy hanging succulent planter with a tray or shallow pot, succulents, threads, and candles. 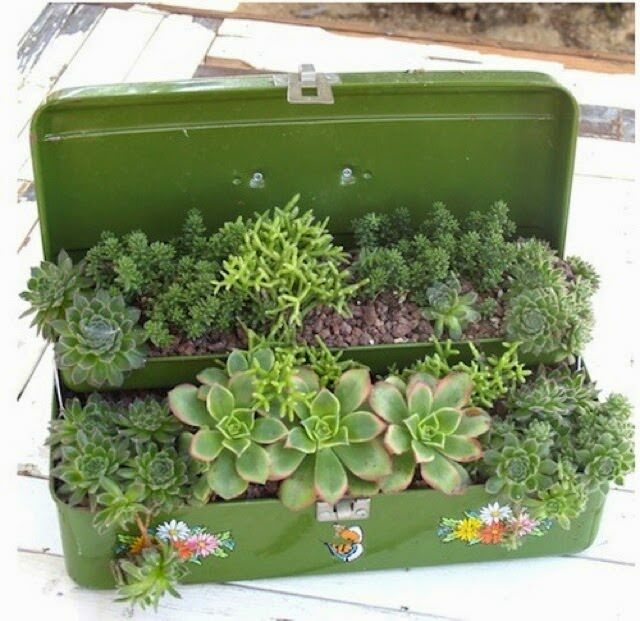 To make it, just plant the succulents in a tray that has holes on sides to hang (or drill a few holes). Hang the tray with the help of threads. You can also put some candles, burn those candles in the night to create an astonishing effect. Ensure you do not hang this in a windy spot. 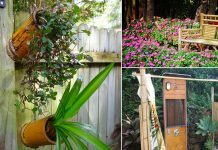 Living frames are a great way to get your plants off the ground and grown them vertically. They let you highlight your plants as an ever-changing work of art in the same way that you would display a picture framed inside your house. To learn all the details how to make it, read this. 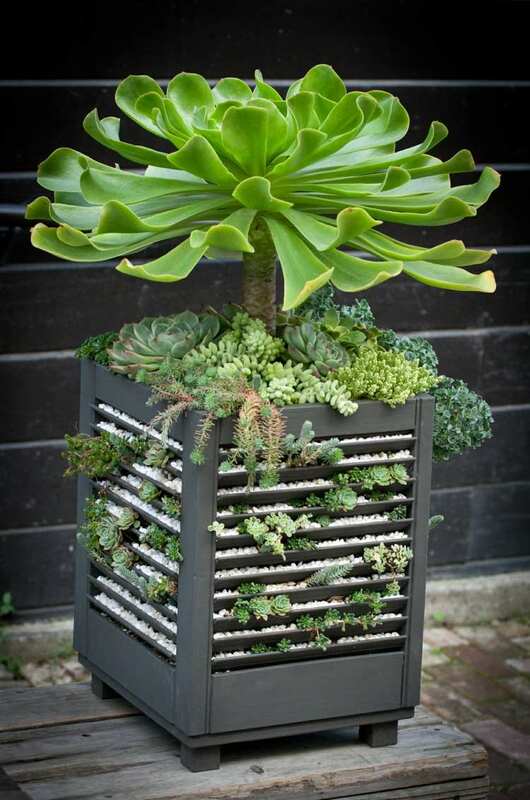 This splendid idea is for your garden, porch or any other outdoor or indoor space. Choose a large pot and grow a tall succulent in it. Also, grow small succulents around the plant and embellish it with decorative gravel. An aquarium without a fish or water. It is indeed a fun project. 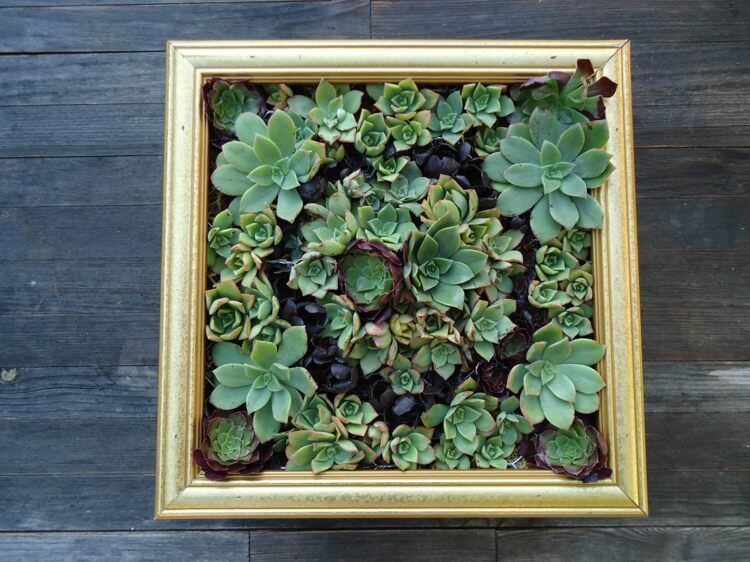 Make a DIY succulent terrarium using succulents of various shapes and textures. The complete tutorial is available here. 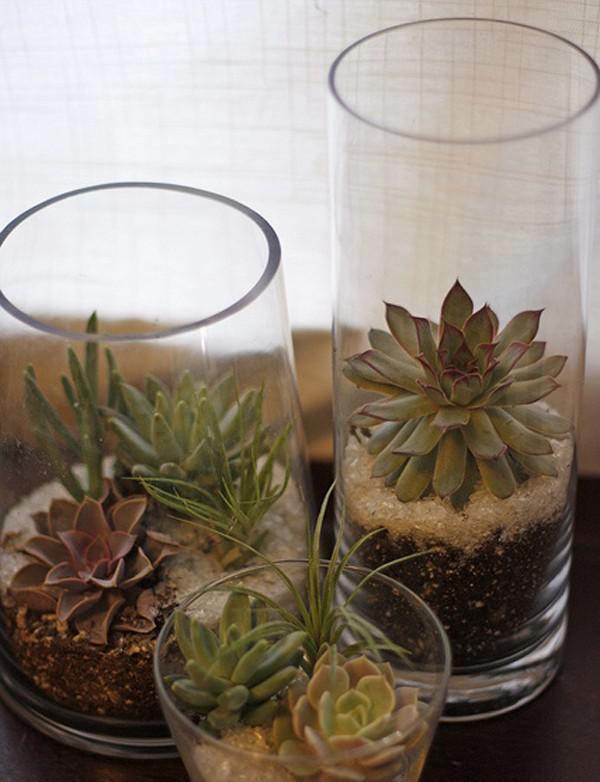 Grow succulents in water glasses. A DIY tutorial can be found here. 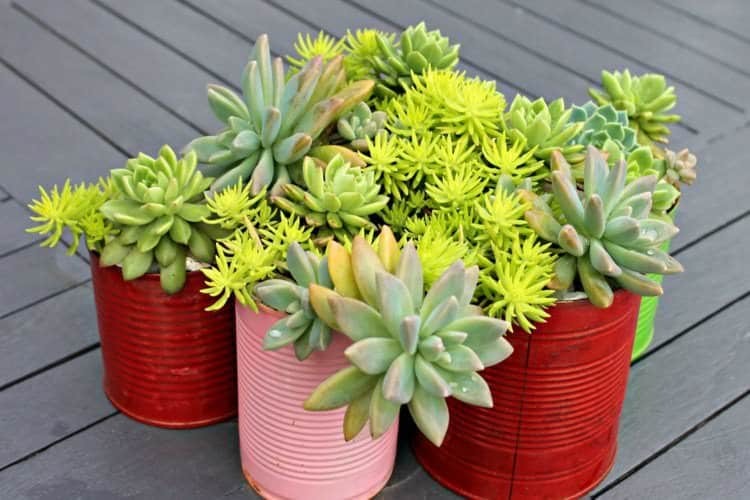 If you have cans, paint them into your favorite color and grow succulents. Plant succulents in a dish and place it on the table top. It will make the focal point of the room. 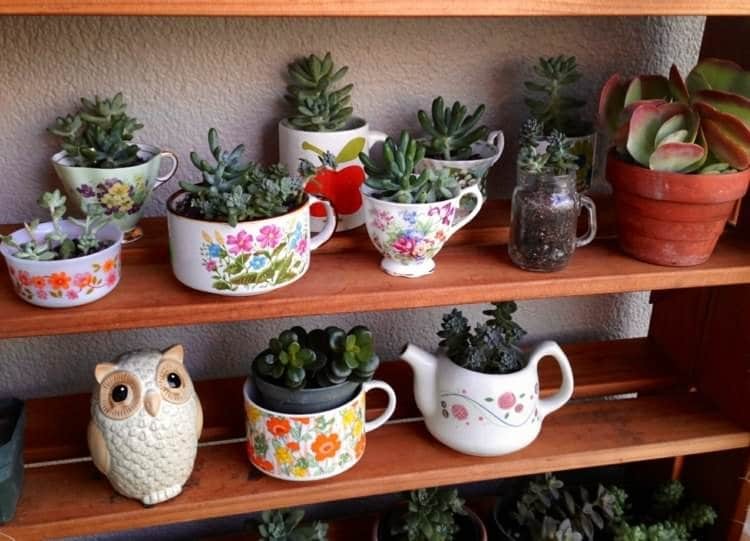 Use old teacups to create a succulent teacup garden. You can check out its tutorial here. 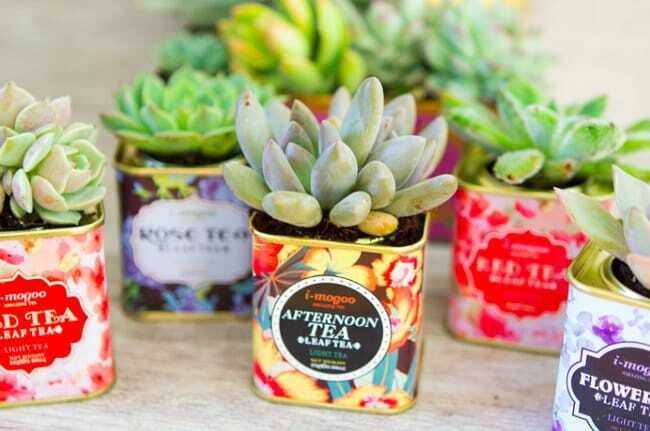 Upcycle your tea tins into these adorable succulent planters. They will become great indoor pots! 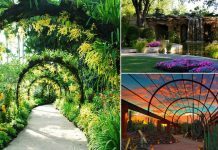 These ideas are all really cool! I’ve always been a sucker for any kind of succulent ideas, especially wacky ones. I do wonder how people think up some of these ideas though? I like the wine bottle one, I think that is my favourite. How would you stop it from rolling over though?